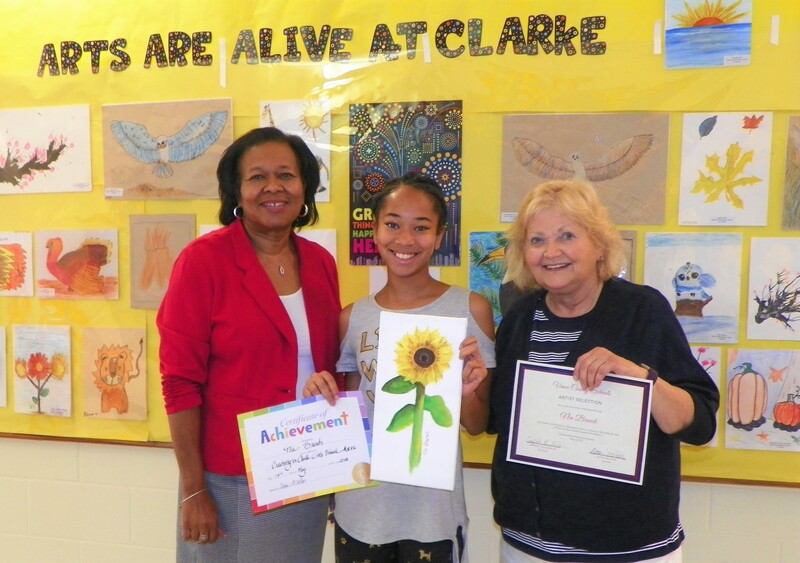 The sunflower painting of Nia Branch, a fifth-grade student at Clarke Elementary School, has been selected to represent Vance County Schools in a display of student artwork from across the state at the N.C. Department of Public Instruction in Raleigh. The sunflower painting, which Nia is holding in the above photo, will actually hang outside the office of N.C. Superintendent of Public Instruction Mark Johnson. It will be included among the 115 pieces of student artwork in the display, with one student’s work from each of the public school districts in North Carolina. Shown in the photo with Nia as she learned of her deserved honor are Clarke Elementary School Principal Crystal Richardson, left, and her art teacher, Alexa Molden. They also are shown with two certificates of recognition which Nia has received for her painting’s selection.